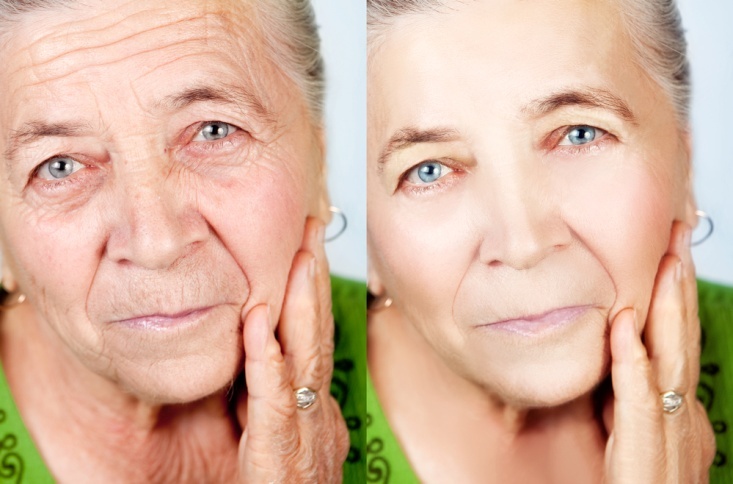 As we get older, many of us will notice wrinkles, age spots, and other signs of getting older. It’s just a factor of nature. When we were younger, many of us may have taken steps to prevent our skin from aging when we got older, such as daily skin care regimens, using sun block, etc. Yet in spite of that care, not everyone’s skin has managed to stay young looking. It may be because of inadequate care or sun exposure, or just a result of genetics. Many of us, as we get older, want to keep our skin looking young, and so we turn to popular things like plastic surgery or botox injections. Plastic surgery has its risks, though, so a better and safer choice would be cosmetic dermatology, like botox. Cosmetic dermatology corrects skin issues such as wrinkles, scars, and acne. Botox is a well-know technique that many people have heard of, thanks to many celebrities using it. Botox is used to smooth out wrinkles and fine lines. But botox is not the only cosmetic dermatology technique available. Dermal fillers are injections used to mimic collagen to add volume and shape to treated areas. Cosmetic lasers are a practical and safe treatment used on sun spots, acne scars, fine lines, spider veins, and varicose veins. Microneedling stimulates your skin into producing more collagen to tighten and improve scar appearance. Kybella is an FDA approved product used to remove the fat from double chins. Hydrafacials are a multi-step treatment including cleansing, exfoliating, extracting, and restoring to improve skin health. Chemical peels remove the outer, dull and damaged layer of your skin to reveal the younger skin beneath. And PRP skin rejuvenation improves skin texture by minimizing pores and fine lines and tightening skin. Removing scars. Not having scars is one of the most important factors in skin health. Many of us have scars, either from acne or some sort of accident. They may be a reminder of some unpleasant incident, and removing them can improve not only your appearance but your attitude. Laser treatment can reduce their appearance, and in some cases even erase them. Improving skin texture can make your skin look better and give it a healthier glow without the need for any dramatic changes. Reducing the appearance of veins. Things like spider veins, caused by sun exposure or an unhealthy lifestyle, and varicose veins can be unpleasant to look at, but laser treatment can reduce their appearance remarkably, or sometimes even remove them. Tightening skin to remove the fine lines around they eyes and mouth, and reducing the appearance of large pores that can make your skin look aged can be done with the right treatment and give your skin a younger appearance. Reducing blemishes, spots, and discoloration. Laser treatment can help to remove red or brown spots from sun exposure, aging, or other pigmentation problems. It can also take care of any unwanted freckles. The most important thing that cosmetic dermatology can help you with is boosting your confidence. When your skin looks good, you feel good about your appearance and yourself. You won’t be worried what other people might think or worried about looking old, and will be more confident and sociable. Cosmetic dermatology is a great way to improve the look of your face. It offers a great variety of treatments, allowing you to choose and customize what you have done according to your needs. Discuss the various options with a certified professional to figure out which work best for you. The decrease in lines around the mouth and improve the fullness of the lips. You are going to learn more about these specific Botox treatment areas, so you can make an informed decision if Botox is the right treatment for you. Crow’s feet refer to those lines around the eyes. These lines become more visible whenever we smile, squint or frown. The skin around the eyes becomes less elastic due to aging and produces wrinkles around the eyes. You can safely apply Botox on these lines, and the treatment is valid up to four months after using it. And there is no other alternative method of treating crow’s feet, other than Botox. Botox is mostly used in the treatment of wrinkles and fine lines. Fine lines are one of the resultant effects of aging. They appear as a result of the contraction of the muscles between the eyebrows and on the forehead daily. Botox is injected into these affected parts, and it works by stopping the contraction of these muscles by freezing them, so the skin cannot age and wrinkle. The jaw is a primary concern for many people. It’s because many people desire a V-shaped face. Aging and excessive weight gain makes the skin to lose its elasticity. In this case, surgical procedures can be risky and costly too. But Botox can be safely used to reduce the jaw area by targeting the jawline’s masseter muscles and reducing the size of the jaw. This will enhance your look and make you regain your youthful vigour. The neck area is the last part of the body that is a significant cause of concern for many people. These areas include the neck and upper chest region. You can use visible neck bands to reduce the signs of aging in these areas. Recently, Botox is combined with other forms of treatment to treat the effect of aging on the chin and neck areas. It works by tightening the muscles in these areas to make the face look firm and younger. These days, the need to take proper care of yourself has become imminent. When you eat right and combine exercise with simple cosmetics treatment options. You can look younger and can live the life of your dreams. Not being able to control the bladder shouldn’t be embarrassing or depressing for your patients. It’s something that many people must deal with. Knowing all they can about incontinence, its causes and its treatments can help your patients feel empowered to deal with the stress and inconvenience of incontinence. It’s a topic many patients are reluctant to talk about, but once word gets around that you can provide help, desperate patients will find you. Isn’t that a great position to be in for you and your practice? Urinary incontinence is a condition that happens when the bladder muscles that control urine flow relax involuntarily, causing leaking or urination. Statistics show that 200 million or more people around the world have this issue. Incontinence isn’t a disease but rather a symptom of a medical condition. It may be temporary and caused by a variety of conditions including a vaginal infection or constipation. It can also be brought on by foods that contain alcohol, caffeine, carbonation or chocolate. It may be chronic and caused by nerve damage, a weak pelvic floor or overactive muscles in the bladder. Incontinence is also associated with certain disabilities. Yes, but different treatments are indicated depending on the cause and severity of the incontinence. Stress incontinence can be treated very successfully in many cases with weight loss, pelvic floor exercises, vaginal weights, electrical stimulation and other treatments. They may not provide lasting relief, however. Estrogen treatment, alpha agonists and surgery may also be required. Surgery can include suspension operations and implanting of artificial urinary sphincters. Can Botox be used to treat urinary continence? Yes, research has shown that small amount of Botox can help with an overactive bladder, one of the causes of incontinence. The procedure involves injecting Botox through a scope inserted in the urethra. By carefully injecting Botox directly into the bladder muscle, urinary incontinence can be reduced or eliminated. As with other therapeutic uses of Botox – like for treating clenching, migraines and excessive sweating – this treatment has shown to be safe and effective in clinical situations. Bladder retraining is an effective treatment for incontinence that can be used along with Botox or on its own. This is accomplished by training the bladder to empty on a specific schedule. The patient must go to the bathroom on this schedule even if they don’t need to go for it to be effective. It also means waiting until this scheduled time even if the patient needs to go sooner. Kegel exercises and other methods are usually involved as well. Why not just recommend adult diapers? Many people with incontinence must wear adult diapers, which are designed for adults and have thick, strong lining. A variety of choices are available. But if something as simple as exercises, void scheduling and Botox injections can reduce or eliminate urinary incontinence, you may be able to relieve your patients from the burden of having to use diapers. Social taboos and a concern about loss of dignity are among the reasons that patients may be unwilling to use adult diapers. Dentox does more than offer Botox training in reducing facial lines and wrinkles. The Dentox class taught by Dr. Howard Katz includes instruction on using Botox for therapeutic purposes – including for excessive sweating, TMD, migraines and urinary continence. Get the skills you need to make a real difference in the lives of your patience when you take Botox training from Dr. Katz. Historically, cosmetic procedures were mostly for women. Today, you can look to statistics or just look around you and see that more men than ever are having cosmetic procedures, including surgery, Botox and more. What was once taboo is now a modern trend. Men are more concerned about their appearance than ever before, and there’s a growing level of acceptance that cosmetic procedures are just a part of modern life. The stigma for men considering cosmetic procedures is fading, but it isn’t gone yet. The American Society for Aesthetic Plastic Surgery keeps stats that indicate at least 1.2 million cosmetic procedures are performed on men each year – a number that’s steadily rising. The organization began keeping statistics in 1997, and the number of men having procedures has more than tripled since then. At least 10 percent of all cosmetic procedures are on men – and yes, that number is growing as well. If your medical or dental office provides cosmetic procedures, there’s even better news. A survey by the American Academy of Facial Plastic and Reconstructive Surgery found that more than a third of men are “extremely likely” to consider a cosmetic procedure in the future, including Botox and other injectables. The reasons given for considering a procedure include feeling more confident, looking younger and staying competitive in their careers. Today, some cosmetic surgeons are offering clinics solely for male clients – so that there won’t be any women patients to see them as they have work done. These centers promise the highest level of care of physicians specially trained to work on men. Where injectables are concerned, there are some differences between how men and women and treated. Men often require larger Botox does than women for the same effect because their facial muscles are larger – but individualized treatment is necessary because this is not always the case. In addition to injectables and surgery, men sometimes turn to aesthetics clinics for chemical peels, liposuction and more. Some centers even offer penile enhancement and other male-specific services at the same location. Other procedures men may have include eye lifts, breast reductions, tummy tucks and even full facelifts. In some cases, men are more squeamish about having surgery than women. That means they’re perfect candidates for Botox and other injectables, which don’t require surgery. Men often don’t want long down times or time away from work either. But injectables can be administered quickly in the office, then the patient can go back to work right away with no or very little bruising or swelling. Men also frequently turn to Botox for excessive sweating, jaw clenching from stress and other therapeutic purposes. They may choose to go to a special clinic for these procedures or have the treatment performed by their regular doctor or dentist as part of a scheduled visit. Dentox is the nation’s leading trainer in Botox, dermal fillers and related injectables. We train doctors, dentists and anyone allowed by law to administer Botox. Led by Dr. Howard Katz, the inventor of Botox training, these fast-paced one-day seminars are the right choice for medical professionals who want to learn the basics without hassles or a large time commitment. Continuing education credit is included, something most medical professionals need anyway. Learn more about Dentox on this website, then sign up for Botox training from Dentox. After your training seminar, get ready for a new world of opportunities meeting the needs of male and female clients. After all, many of them are going to get injectables anyway. It might as well be from you. If you haven’t visited a barbershop recently, you may not realize that times have changed. They aren’t like they used to be. Today’s barbershops sometimes offer men as many services and amenities as hair salons offer women. This can include hot towels, massages, a selection of craft beers and so much more. And now, some salons are offering “brotox” – a cutesy name these haircutters use for men’s cosmetic Botox treatments. It seems men are turning to the places they’re already visiting for the Botox they want and need to reduce fine lines and get rid of furrowed brows and more. A barbershop – like a doctor’s or dentist’s office – is safe space. It’s comfortable, familiar and inviting. In fact, some of the nation’s biggest and best barbershops are now offering Botox, validating for men that taking care of themselves is acceptable and normal. Like a doctor or dentist, a barber is also close to the face, something men accept. So it just makes sense that barbers would offer Botox where allowed by law. In today’s world, male celebrities and TV personalities speak openly about cosmetic treatments in interviews and on social media. 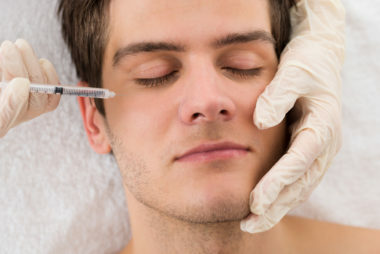 Because more and more men see Botox and other cosmetic treatments as normal now, the number of guys going for the needle is increasing, according to research. And the trend is likely to continue. Men are pressured at work to look and act young and vital. Their girlfriends and even their mothers are having cosmetic procedures, making them look like the odd man out if they don’t take advantage of today’s cosmetic miracles. With proper Botox treatment, a man can get amazing results. The most common injection site for men is on the frown lines – so that they look less cranky or angry. The next most common injection site is along the horizontal lines on the forehead. In this case, less is more for natural-looking results that no one will notice. Ideally, most men who seek Botox at the barbershop – or anywhere else – want to look fresh and well-rested, but they don’t want to appear to have had work done. The smallest correction is all that some men want, while others are willing to go a bit farther. But most men don’t want the work to be noticeable. Some men simply turn to their regular doctor for Botox. After all, they visit the office once or twice a year anyway, so they might as well get some lines reduced while they’re there. The dentist’s office is also a popular spot for men who are seeking out Botox injections. Dentists can provide teeth whitening, veneers and other cosmetic procedures related to the teeth to further help men look younger. Many men find it easier to accept having a barber, doctor or dentist they already know perform Botox than visiting the office of someone who specializes in cosmetic procedures. In addition to reducing the stigma associated with having cosmetic treatments, men are often apprehensive about visiting an office that they feel may be geared toward women. Dentox teaches doctors, dentists and others who are allowed by law to inject Botox the skills necessary to satisfy both men and women. We teach cosmetic Botox application as well as Botox for therapeutic purposes. And we do it all in multiple locations around the United States. If it’s time for you to get the skills to take your business to the next level, sign up for a one-day Botox training class from Dentox and Dr. Howard Katz. There’s probably one coming up near you. Some doctors and dentists are now promoting male-only Botox and injectables practices that offer an experience more like a sports bar than a medical office. Imagine leather sofa, cigars and highballs on offer. For male Botox and male cosmetic surgery, it’s a trend that’s working. Many of these medical professionals report getting more male clients than ever. And this marketing effort aimed at men isn’t just the invention of a few innovative doctors. It’s part of a concerted effort by Botox maker Allergan. 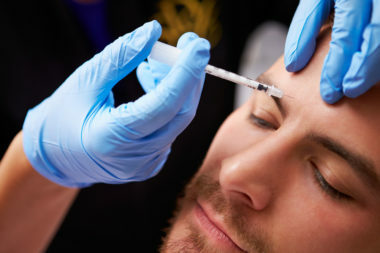 The media has dubbed the current trend toward injectables for men “Brotox”. And the Allergan effort behind this emphasis on Botox for men includes television, social media and print ads specifically intended to lure men. Ads have run during the Stanley Cup, baseball games and at other times when statistics show that men are watching. An Allergan spokesman admits in media interviews that the campaign is larger in scale than any past campaign by the company aimed at men, but he didn’t disclose the size of the investment. In 2017, almost half a million men got Botox injections. While that’s just a small fraction of the 7.2 million women who got Botox, it’s still significant. And the number of men going under the needle has increased almost five times since 2000. Allergan has a bit of catching up to do in getting its share of that business. Rival product Dysport from Galderma has been heavily targeting men for more than 2 years with a male-specific website. Its loyalty program has increased enrollment by 45 percent in a recent 12-month period, a rate that’s growing faster than its female loyalty program. Merz Pharma’s Xeomin has been marketed toward men since 2016. Still, Allergan has one big advantage: It’s an iconic brand with a product name that defines that category. Some analysts point out, however, that it’s a brand that mostly resonates with women. Allergan’s CEO Brent Saunders isn’t just the leader of the brand, he’s also a client of it. Not long after getting the top job at the company his colleagues injected him with Botox at a sales meeting – live on stage. He said he continues to get regular Botox injections. He’s 48, proving to customers that Botox isn’t just for old men. In fact, the average male Botox client is around 42, but it’s not uncommon for people to get injections in their 20s. Market analysts say that the biggest stumbling block in marketing Botox to men is that the male half of the population mostly either don’t know much about Botox or don’t understand its safety and effectiveness. Men often must learn of injectables from word of mouth – if they happen to know someone open enough to share. 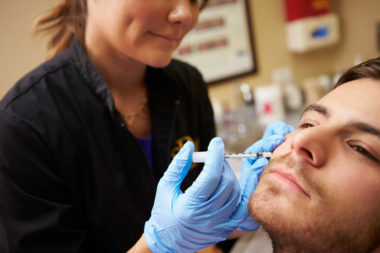 Marketing push or not, the trend toward men getting Botox is expected to continue. Allergan is banking on the trend growing quickly and by great numbers. Your practice can be part of the Botox revolution involving both men and women if you get the right training. Botox training from Dentox is available online and in locations around the country and takes only a single day. During that day, you can pick up Continuing Education credit as well as all the skills you need to inject Botox. You may even be able to inject a live patient during the training seminar. Learn more about Dentox courses on Botox for cosmetic and therapeutic purposes. Then sign up. Soon, you can add Botox to your established medical or dental practice or even open a new aesthetics clinic. The possibilities are endless when you have the right training. Looking for some great news that can result in a boost to your practice? The original Botox training class – the Dentox course from Dr. Howard Katz – is coming up soon in San Diego. It’s a chance for California doctors and dentists to learn from the man who created Botox and dermal filler training and whose name is synonymous with therapeutic and cosmetic use of injectables. There’s no need to travel far when you can take the one-day course soon – right here in San Diego. Dentox is pleased to offer something new in our San Diego training class: instruction on Platelet-Rich Plasma therapy – or PRP. This innovative therapy was developed for the doctor’s or dentist’s office by Dr. Katz and is already gaining in popularity and acceptance worldwide. You may already have patients asking for it. PRP is great for two purposes: It can be a cost-effective alternative to dermal fillers for patients with lines and wrinkles not eliminated with Botox. It can also be used for therapeutic purposes to help your bone graft, tissue graft or dental implant patients heal from their procedures better and faster. So how does PRP work? Using a special centrifuge you can set up in your office, you can refine your patient’s blood into an injectable product. The result is less expensive than dermal fillers, providing cost savings for you and your patient. And it can aid in healing like nothing else. Even better, there’s no risk of allergic reaction because it’s made from your patient’s own blood. PRP is newly developed for doctor and dental offices by Dr. Katz and can’t be learned just anywhere. When you take Botox training in San Diego, however, a module is devoted to the revolution in injectables. We strongly suggest you arrive early and stay late for networking. When you make the smart choice to join us at our home base in San Diego for filler and Botox training from Dr. Katz, you’re selecting to learn useful, important skills that can enhance your practice and boost its bottom line – from the proven leader in the injectables industry. California doctors and dentists are sure to benefit from this new sideline – a sideline that might just become your primary business. Take the career-changing step to move yourself and your practice forward with Botox injectables training in San Diego from Dentox. The location is comfortable and convenient, the Continuing Education credit is something you need anyway and the price is affordable. Why not sign up now? 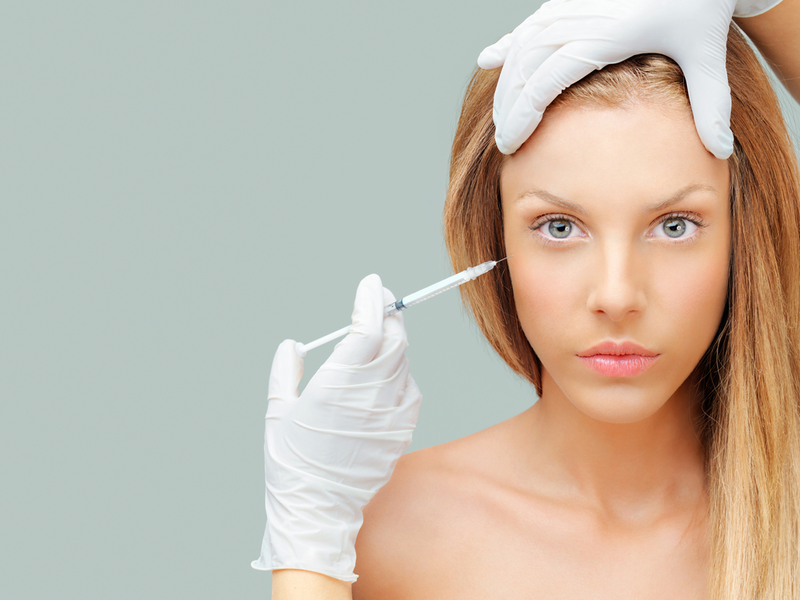 Like with any procedure, Botox treatments can result in side-effects. What’s interesting, especially to professionals new to medical aesthetics, is that the treatment for Botox’s side effects is….more Botox. 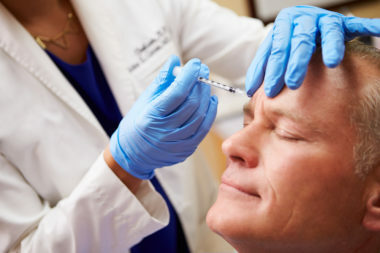 Part and parcel with providing Botox injections to patients is preparing effectively to quickly treat patients returning with complaints of one of the few common side effects. Dr. Katz provides a brief overview of the procedure for saving a portion of your Botox supply for this eventuality. Thought not explicitly discussed in the video, the word “save” has a second, and just an important meaning. Though our instructor advises us on how to put aside a certain dose of Botox for the treatment of side effects, his advice is also going to save us money. 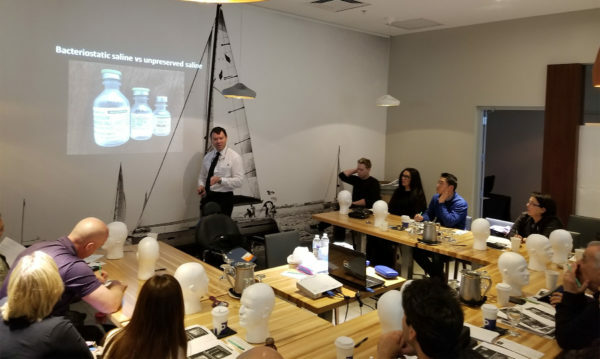 Dentox training courses have become well-known for not just the quality of the medical training, but also the powerful marketing and business advice. If you’re new to the field, as many of our course participants are, then you need the best advice from a fellow professional who’s been in the business for decades. The tip in this video is simple. At Dentox, we endorse a straightforward curriculum that has only the most useful and accessible knowledge related to the best medical practices and best business practices. Elegant and impactful professional insider knowledge doesn’t need to be complex and packed full of meaningless important-sounding jargon. We want participants to be impressed only with the immediate effect our training courses have on the success of their practice. And, that is what this next YouTube hidden gem features. In just under two minutes, Dr. Katz provides this advice: don’t shake the bottle after you add the Botulinum toxin to the saline solution. Botulinum toxin molecules are very fragile, and shaking the vial (as you will be tempted to do from habit) reduces its potency. Interestingly, in this business you will find that sometimes the best practices are counterintuitive. But, Dr. Katz sees you through the logic of this tip in the same straightforward and experienced manner he runs our in-person and online injectables courses.